The triangle has always been an important element of a kitchens design and functionality. 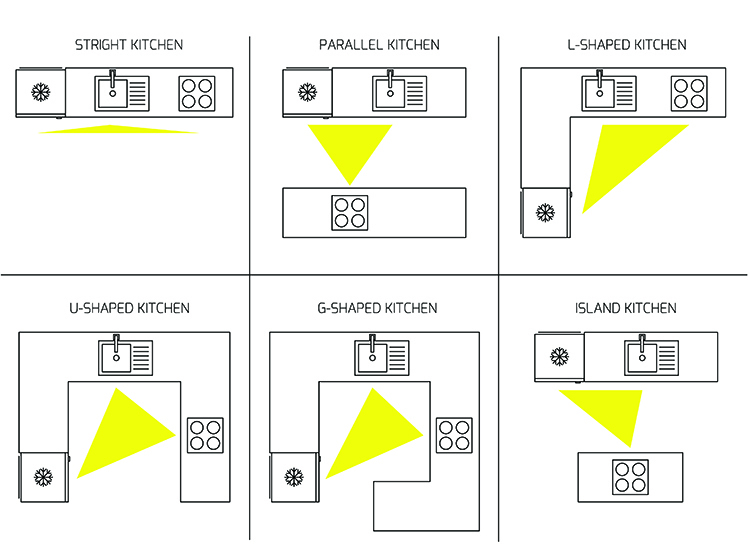 Meant to make cooking easier, faster and logical, the kitchen triangle regulates workflow and productivity. Since the primary tasks in a kitchen are carried out between the cook top, the sink, and the refrigerator, the cook should be able to move easily between those three zones. So if you’re about to undertake a kitchen remodel, you might want to consider our tips for designing the classic kitchen triangle. The triangle is a relatively simple idea that can save time and energy in the kitchen space. In the most basic terms, the kitchen triangle connects the three fundamental work areas: the sink, the range, and the refrigerator. Our first tip is to make sure that the distances between the three principle zones is not too far, allowing the cook to move from storage and cleaning to cooking with a simple step and turn. The distance between each sector should measure between four and nine feet. Remember, efficiency is the triangles main goal! It is also important to ensure that no other zones are located within the triangle. Islands, and cabinets should be built in surrounding areas. Additionally, no major traffic patterns should cross through these three stations. As you know, the cook should never be interrupted or interfered with. Lastly, we suggest building extended counter-space in both the range and sink zones. Adequate prep space is often forgotten because it is not explicitly included in the classic geometric equation. However, you might consider building one prep area near the sink and one near the stove for a more enjoyable and streamlined life in the kitchen. With this extra counter-space you can place cookware and spices near the stove for an even smoother performance. If you frequently cook with other people, your kitchen design will have to be more complex and thought out to make sure no one is bumping into each other. When it comes to designing your home, there are no set rules. Above all else, you want your kitchen to work for you. While the kitchen work triangle is a great guide, by no means is it set in stone. Do you have proper triangle set up in your kitchen? We’d love to hear about your layout in the comment section below.